Whether you've got a passion for these fine-feathered fowl or a budding interest, we've got the pop culture course tools to feed your need and make you a well-rounded flamingo aficionado. In 1957, a young sculptor named Don Featherstone was hired by a plastics company in Leominster, Massachusetts. Hoping to capitalize on the color of the moment, they asked him to design a pink flamingo. The sculpture soon popped up on lawns across America, a symbol of post–World War II suburban sprawl. But by the ’60s the yard decor had turned tacky. Enter the king of bad taste, filmmaker John Waters. Wanting a “very normal title” for his drag-queen opus, he named the movie Pink Flamingos, breathing new life into the plastic birds and turning them into an inside joke. In this fact trove, Bill McLain reveals that flamingos eat with their heads upside down, always walk on their toes, can stand for hours on one leg, and can live to the ripe old age of 50. Ancient Romans considered their tongues a delicacy. 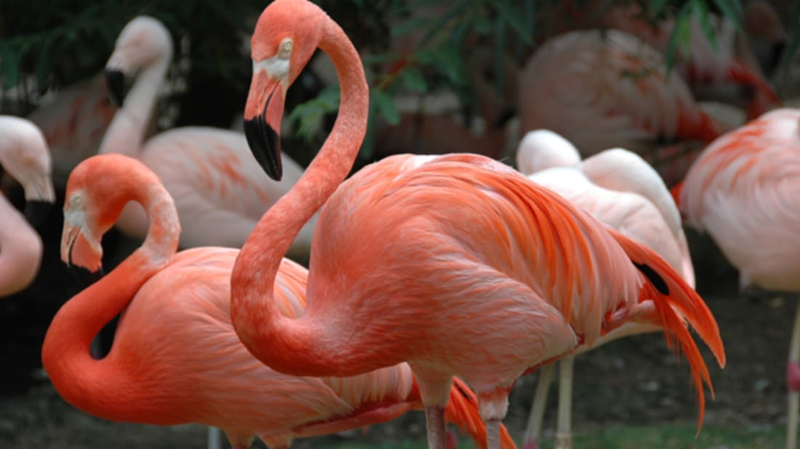 And if you put a flamingo on a diet free of carotenoids, the pigment they get from eating crustaceans, the bird will turn white. Once or twice a year, typically after it rains, flamingos gather in a large crowd and start to rave. In a ritualistic shimmy to find mates, they spin their necks side to side, tapping their toes, puttering left and right, and moving together as one adorable pink platoon. Like humans, they even preen before the big dance, using their beaks to apply “makeup” (pigment secreted from their posteriors) to make their feathers extra bright. East Africa is home to three-quarters of the world’s unfortunately named “lesser flamingo” (they’re the smallest species of the bird). But in 2006, the Tanzanian government tried to build a factory to extract soda ash from Lake Natron, the flamingo’s only breeding site in that part of the world. With nearly 2.5 million birds in danger, Think Pink rallied 120 NGOs, launched a petition of 23 African countries, and used public outcry to shut down plans for the factory.